As well as general workshop servicing we also undertake specific engine work. If your bike has developed an unknown noise or fault we can undergo a full diagnostic assessment, source OEM or performance parts. We also undertake engine tuning and are a supplier of many performance parts. Please see our online shop. it may just need re-boring for the next oversize piston. This can be done easily and we can supply a range of pistons and gasket sets usually from stock including Mitaka, Wossner and Wiseco. We can also fit a new steel liner to your original cylinder if yours is damaged or beyond re-boring. Fitting a steel liner can also be done as a cheaper alternative to re-plating a Nikasil cylinder. The rebore process takes approximately 2 weeks, during busier periods, this can be longer. The resleeving process takes up to 3-4 weeks, during busier periods, this can be longer. The replating process takes up to 3-4 weeks; during busier periods, this will be longer. 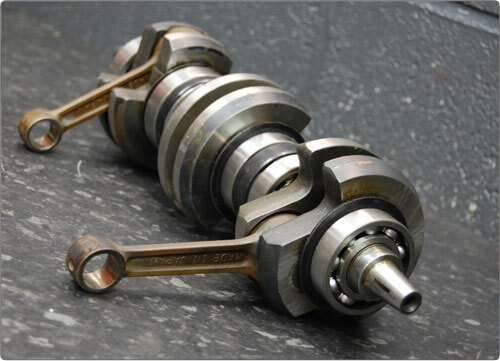 Most crankshafts are rebuildable so having yours serviced and repaired can be a huge saving on buying a new one. Please contact us and see how much we can rebuild yours for. Prices start from as little as £85. 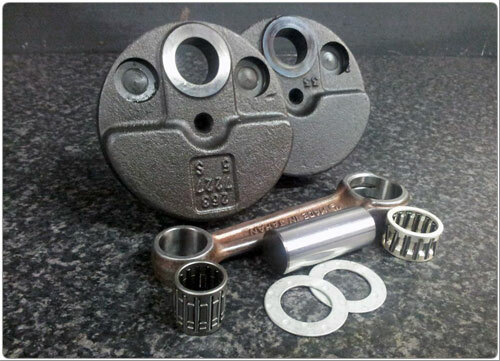 We also supply original replacement and race cranks, please see our online shop for prices. Looking to buy motorcycle engine parts online? We stock a large range of motorcycle engine parts in our workshop which can be ordered online and shipped direct to you.